Bodowyr is a Neolithic burial chamber, or passage grave. The chamber consists of three large upright stones with a capstone on top, and the interior is reached by a short passageway at the east end. Easy, signed access in a farm field makes this one of the most visited prehistoric sites on Anglesey. 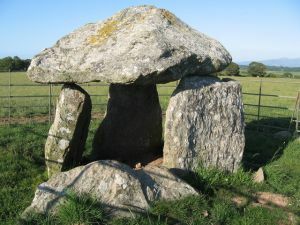 The style is quite similar to other Neolithic burial chambers on Anglesey. Three large uprights support a capstone that rather resembles a giant mushroom, with a wide base rising to a peak. The capstone is about 8 feet long and 6 feet wide. At the entrance to the original passage is a sill stone, and there is another short stone inside the entrance that may have formed part of a sill. The chamber would originally have been covered with earth, but the covering is long gone, leaving only the stone frame of the tomb. It is hard to be precise about exactly when the chamber was erected; this style of burial was in use for almost 2000 years, from about 4000 BC to around 2000 BC. The site has never been excavated so we do not know if anyone was indeed buried here. The burial chamber is in a field on a minor road north-west of Brynsiencyn village. From the village take the minor road towards Llangaffo, and continue straight across the next junction up a lane. There is a small layby for parking beside a metal gate into the field. The chamber is protected by an iron railing but is extremely easy to see. Location: Located on a minor road just east of Llangaffo village, between Llangaffo and Brynsiencyn. The nearest postcode is LL60 6NH.